For the 21st century bookworm, an e-reader is a must-have. Don’t get me wrong, I am still very pro-traditional book; however, an e-reader can be great for a number of reasons. Myself personally, I think that’s great to be able to carry multiple books in one lightweight device, especially if you’re traveling and want to save space. Not to mention it can be a space saver in general, especially for bookworms like myself who have to do a yearly “book purge” and agonizing over which books to let go of to charities or yard sales, just so they don’t pile up so much to the point where the bedroom becomes more of a book jungle than a place of rest. I’ve not only become rather weary of the annual book purge ceremony I perform every spring; it can be both physically and emotionally taxing, as oftentimes I need to decide which book I like less. Now, myself being the type that only buys a book if I think I will be reading it until all the pages yellow and fall out, you can see how this becomes quite an issue. Ever since Amazon introduced its first Kindle e-reader back in 2007, I’ve been keeping an eye on it and other competing e-readers and tablets. Hopefully this will help someone reach an informed decision, especially if you’re the type of consumer that likes to wait for the absolute perfect model before investing. Being that kind of buyer myself, I held out until this model of the Kindle, and I have to say, I wish I had waited perhaps a year or two longer. I firmly believe that Amazon is one of those companies that really listens and actually uses the feedback its customers provide, and I have confidence that Amazon will probably work out all the minor details in its next update, which I greatly look forward to. Just like I don’t see the need to upgrade from my iPad 2 any time soon (and goodness knows I waited ages before upgrading to Nintendo’s 3DS and Sony’s PS Vita), I hope that the next Kindle Amazon rolls out is one that I would purchase and probably use until it wears out completely and just can’t be revived. As far as tablets go, I’m an Apple girl. I think they have the strongest tablet in the market, and I’m not just saying that because of the brand name. I’ve given other tablets a shot, and they just didn’t meet my expectations. 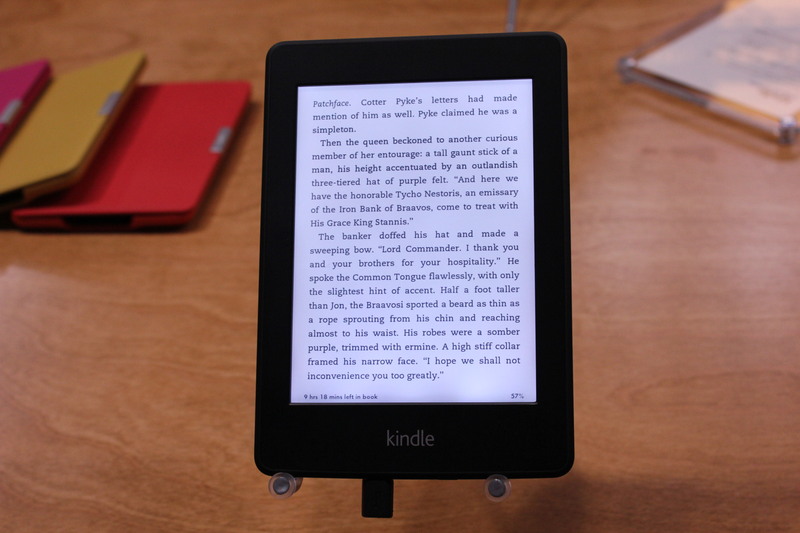 Now, when it comes to e-readers? I think that’s where Amazon wins. Sure, the Apple-loving side of me was extremely tempted to go purchase the iPad Mini, but it just wouldn’t have made sense. I didn’t want what’s basically a smaller version of the same gadget I own, with all the bells and whistles. I wanted a device that would give me the best reading experience and value for reading books, and just books. After extensive research and constant fiddling with demos in stores like Barnes & Noble and Best Buy, I finally decided to take the plunge and purchase an Amazon e-reader—specifically the Amazon Kindle Paperwhite. Why not the Kindle Fire HD? For the same reason I didn’t go for the iPad Mini or similar “all-in-one” tablets; getting a device that will let me read books with the least amount of eyestrain. What I am about to say next is probably going to sound really nerdy, but it is how I truly feel. I will probably still buy traditional hardcover and paperback books even while owning a Kindle, mostly because I don’t think anything can really replace the pleasure that comes from traditional book reading. However, those purchases will now be far less frequent and much more selective, since I will now only be purchasing books that I consider to not only have great re-reading value, but also ones that I would not want to ever lose should something ever “happen” to my electronic device and/or its data. Anyway, while I could really talk all day about my passion for books and reading, I realize I need to come back to the point of this entry and now give my review of the device. Based on my personal experiences after having toyed with it for quite some time now, I think I have thoroughly nitpicked every single thing I possibly could about the device. Below is my lists of pros and cons for the wi-fi version of Amazon’s Kindle Paperwhite. 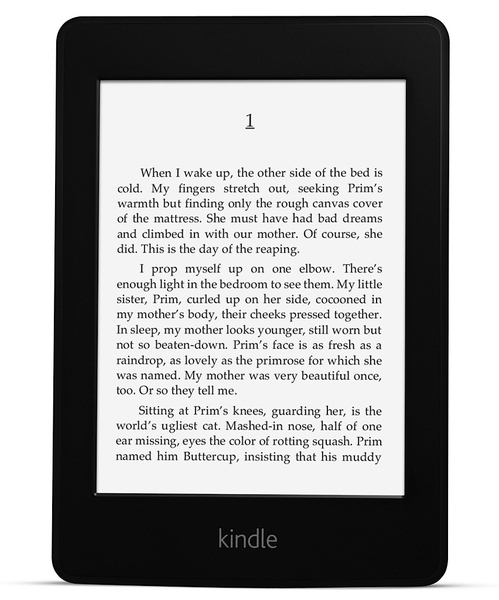 The Paperwhite is a touch screen model, which I think is great since I think the use of the buttons to turn pages and access items from the menu makes the entry level Kindles seem more dated. The light used to create the “Paperwhite” effect actually doesn’t cause me any noticeable eyestrain. With my iPad 2 and my laptop, I find that I need to take breaks every now because my eyes start to get dry. With the Kindle Paperwhite, I’ve found that I’m actually able to read for hours without much eyestrain. My eyes do eventually get tired, but I think the feeling is a lot closer to getting tired from reading a lot of books than staring at a digital screen. The Paperwhite is fairly lightweight (though after placing it in a protective case, the case makes it a bit heavier to hold), small, and easy for travel. Unlimited cloud storage for Amazon eBooks. This I think is fantastic, since I imagine eventually I’ll be purchasing a lot more than what the Kindle is made to hold. As far as I’m aware, there’s no expandable memory for this device, so I think that the unlimited cloud storage is an important feature Amazon provides. The touch functions are actually just the right amount of sensitivity. My only complaint is when I’m trying to switch back and forth between pages on my home screen. Other than that, scrolling through eBook searches, turning pages, and choosing options from the main toolbar isn’t too much of a hassle. The touch keyboard is actually not too shabby either. Instead of removing the “home” button altogether, I wish they just improved on its functionality from the previous touch screen Kindle model. Sometimes, while trying to get back to the home screen (by double tapping at the top of the screen) I end up turning pages I don’t mean to turn in the book I’m reading. They’ve nixed the audio functions, and while I’m not an audio book person myself, the lack of such a feature may be considered a deal breaker for some. Your non-Amazon e-Book files need to be in a larger font than the typical pt. 12 font if you want it to be readable on the Kindle. The Kindle does have a zoom function, but sometimes it zooms in way too much with no way to make it zoom to fit all the text comfortably into the screen like you can with an iPad or another tablet. You cannot put a “subcategory” or “sub-collection” within a collection. This can be a problem if you like viewing your home screen in “cover mode” (where you see the “covers” of your collections with titles) as opposed to list form, and you’re trying to keep everything to one page. The idea of a lending library is great, but due to the disagreements between Amazon and several major publishing houses, the content available is severely limited, and from what I’ve found it’s mostly books written by new up and coming type of authors. Great in helping to discover the next Stephen King or J.K. Rowling, but from what I’ve researched, this is a terrible deal for rising authors because it devalues their product by offering it up for free against their will. Also, it limits the consumer in ways, especially those who don’t want to waste their “once a month” lending limit on a book they will not at least have an idea whether or not they’d enjoy, because they’re not familiar with the author who wrote it. There is an alternative to borrowing books, however, and that is you can try and see if the book you’re looking for is available in Overdrive, the e-Library. If it’s available, then select the Kindle format of the book during the checkout process. The only annoying thing about this is oftentimes I’ve found that the waiting lists for some of these books are ridiculously long, there’s a limit to how many books you may place on hold, a limited number that you can check out at a time (as well as a limit to how many times you can swap books within a certain time frame), and while the e-Library seems to be expanding, it is doing so rather slowly. For the voracious reader like me, these are suffocating restrictions. I can easily read 3-5 whole books (depending on the length of each book and how engaged I am in reading) in any given day. I’m the type of person that likes to read the book once through before I decide whether or not I’m going to purchase it. Call me strange, but as an aspiring writer myself, I feel obligated to support other authors whose works I end up especially enjoying. Anyway, back to the list. Another downside of the lending library is that it can be frustrating to navigate. There’s no way to search within just the lending library. The search bar searches all of Amazon’s eBooks, both those you can borrow and those you must purchase. Which leads to another problem. On my iPad 2, I absolutely adore the Overdrive app. It allows me to borrow eBooks from my local library. While they don’t necessarily have every book on this planet available either, at the very least they have several familiar authors available for borrowing like Eoin Colfer and Rick Riordan. I wish the Overdrive app was available for this version of the Kindle, because that would make borrowing books so much easier. Not to mention, not all borrowable books through Overdrive are available in Kindle format, and from what I understand, the ePub format doesn’t work on a Kindle, which is rather unfortunate. The lighting is uneven, and it’s mostly noticeable during the evening hours. While this does not bother me personally, I can see how it could distract some readers out there. The web browsing function is mediocre at best. I don’t really need to use it for the web, but some people might want to only have to carry around one tablet-like device. If that’s the case, you’re better off investing in an actual tablet. The Kindle web browser is not only slow, it has a high chance of crashing. As far as I can tell, the Kindle doesn’t really turn off all the way, which is a shame if you want to save power. Even when I held the power button until the system seemingly shut down, the minute I tap the screen or open the flap of my Kindle cover, the system just powers up automatically. By going for the Paperwhite or e-ink versions, you’re trading seeing book covers and magazines in color. Those are the only two things I ever want to see in color and wish they could incorporate that for e-Readers as well, but unfortunately I don’t think that’s ever going to happen. If you seriously can’t give up the color, stick with the traditional print or get yourself a tablet. I don’t get why they don’t include the charger for the Kindle as well in the box. Sure they provide the USB cord, but why not the outlet end? Perhaps it’s to make a little more profit. Still, I think it’s silly. Even video game consoles come with the full charger in the box. And now for my two biggest quips. Perhaps I am asking too much, but I was hoping with the Paperwhite, we’d be getting the best of both worlds—the “Paperwhite” display, and the “E-Ink Pearl” display. While the Paperwhite is a higher resolution of the E-Ink Pearl, I actually really liked the E-Ink Pearl feel, and I think that it’s fantastic for at least during the morning hours when there’s enough daylight. Even powered all the way down, you can still kind of notice the light on the screen, and it’s not completely like a page of a book like the E-Ink Pearl displays are. So then, to buy, or not to buy…? You really want/need an e-Reader right this minute, and also because since there aren’t any rumors as far as I can tell of a better version coming up any time soon, and you don’t feel like waiting for the rumor. As far as e-Readers go, I think Amazon’s Kindles have always been the strongest. You’re able to wait for an updated Kindle that will at least improve on some of the areas where it falls short as a Kindle reader. Personally, I think I could have waited a bit longer, had I known all of this sooner. I think I jumped in a tad too early, but what’s done is done. I still like the product, but with all the features I feel like it’s missing, I’m not sure if it is completely worth the price I paid for it. I will definitely be keeping my eye out for a future upgrade; however, I’ll invest only if the newer model gets pretty close to what I’m hoping for. If not, I’m sticking with what I’ve got. I might be a tech junkie, but I’m not one of those that has to collect every single model. I got the model without the commercials, since I don’t like ads on anything. If you don’t mind the ads though, definitely go with the cheaper version. Lastly, unless you’re an impulsive book purchaser or if you’re constantly traveling (and hardly come by free wi-fi access points), I wouldn’t invest in the 3G model, as that is far pricier in the long run. Well, there you have it. I think that just about wraps it up. I’ll edit the entry if I can think of anything more. Feel free to sound off your thoughts in the comments! See you all again next entry! Hey Rae, nice write up. I have been thinking about getting a Kindle for a bit now. Like you, I already have an iPad 2. (that I love) But I am looking for something that only does reading. I don’t want a web browser or anything else to get me distracted from just relaxing and reading and I wanted something that I could read in direct sunlight since I live in SoCal and I should probably try and get more outdoor time. 😉 It doesn’t look like this guy is going to fit the bill. Honestly I’ve played with different readers, not just Kindle and Nook, but also Kobo and I think a couple of Sony models. I still think Kindle is the best option out of all the ones I’ve tried. If you’re able to hold out just a little bit longer, I would. Call me an optimist, but I really do have faith that Amazon will eventually improve its e-reader to a point fairly close to complete satisfaction.